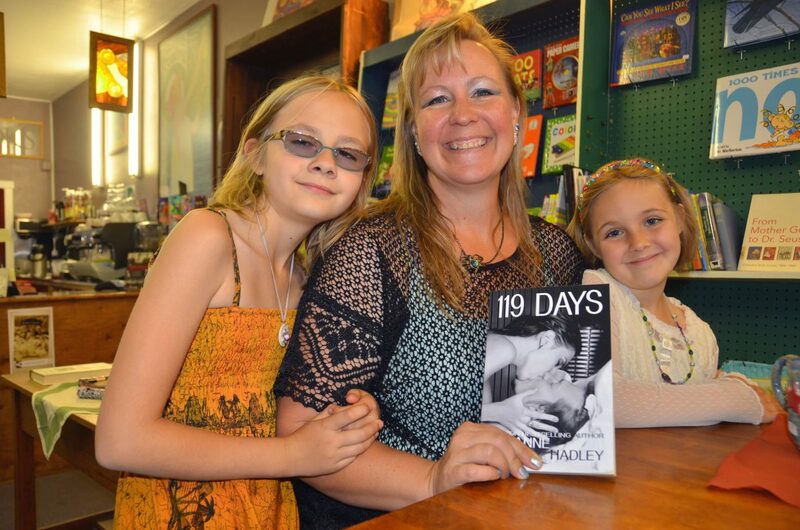 Craig author RaeAnne Hadley, center, and daughters Madison, 10, left, and Ashlie, 7, display a copy of RaeAnne Hadley's new novel "119 Days" at a table at Downtown Books. The book was released online in mid-May and soon will be available in hard copies. Hadley plans to host book signing events, as well. Craig — RaeAnne Hadley believes in the power of love. It’s something that’s been featured consistently in her work, and the inspiration that comes to her has struck again. Hadley recently released her sixth book, “119 Days,” which first became available through online sellers Amazon and Barnes & Noble in mid-May. This is the first novel the local author has been able to put forth in more than two years, but that’s not to say she hasn’t been writing during that time. “There were times when I was working on seven books at a time just depending on my mood,” she said. “119 Days” was originally intended to be released Jan. 19 (1/19), also 119 days after RaeAnne’s initial announcement of the book. The marketing didn’t quite work out, but she was still able to pick a date that was special to her — the birthday of her late father, who championed her writing career until he passed away six years ago. “He held my first book in his hands two days before he died,” she said. RaeAnne’s other books have been largely fictional, but the latest is closer to reality than any other, based on the account of a friend, a divorcee whose disdain for serious relationships after her own bad experiences changed upon meeting a new paramour. The book, part of a planned series, already has been selling well online, and Hadley plans to promote it more with signing events as paperbacks are released. Her regular readers will notice the cover art to be slightly steamier, featuring an intimate portrait of two lovers kissing passionately. Despite this and a somewhat more adult tone in the text, she doesn’t want people to mistake her style for something else. Even so, “119 Days” is a selection that will remain off the reading lists of RaeAnne’s daughters — Madison, 10, and Ashlie, nearly 8 — as far as she’s concerned. Although the content isn’t something they’re allowed to peruse, the girls love having a writer for a mom. “I’m so proud of her for doing this,” Madison said. RaeAnne said her husband, Steve, also has been a driving force for her in assisting with the promotional aspects of her writing, and ultimately, she hopes to become a “household name” among readers. “My whole family has been amazing during the writing process,” she said.